One of the heroes of the England cricket team's Ashes-winning summer, Ashley Giles, is to be made an honorary citizen of his home town. The Mayor of Droitwich Spa, Richard Morris, confirmed the spin bowler would receive the unique award next month. Giles, who plays his county cricket for Warwickshire, had been in line for the freedom of the Worcestershire town. The honorary citizen title has instead been created for Giles, who does not meet the usual criteria for a freeman. Mr Morris said: "It is with great pleasure that I can announce that I will be honouring Ashley Giles, as a resident of Droitwich Spa, for his role within the Ashes-winning England cricket team." A town council spokesperson said: "It's a mayor's award, while an honorary freeman is a town council award." She explained that the honour did not confer any special privileges on Giles, as the freedom of the town would. "He really didn't fit into the criteria for an honorary freeman," the spokesperson said. "He hasn't carried out any community service, so that's why it's been done this way. "It's really just an acknowledgement of his achievement." 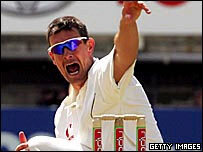 Giles made an important contribution with both bat and ball in the Ashes series, which England won 2-1. He dismissed all of Australia's top eight batsmen at least once, scored the winning runs at Trent Bridge and finished the series at The Oval with a Test best innings of 59. He also took five catches. The ceremony will take place on 14 October and, although it is a private occasion, Giles has said he is prepared to sign autographs for local children.